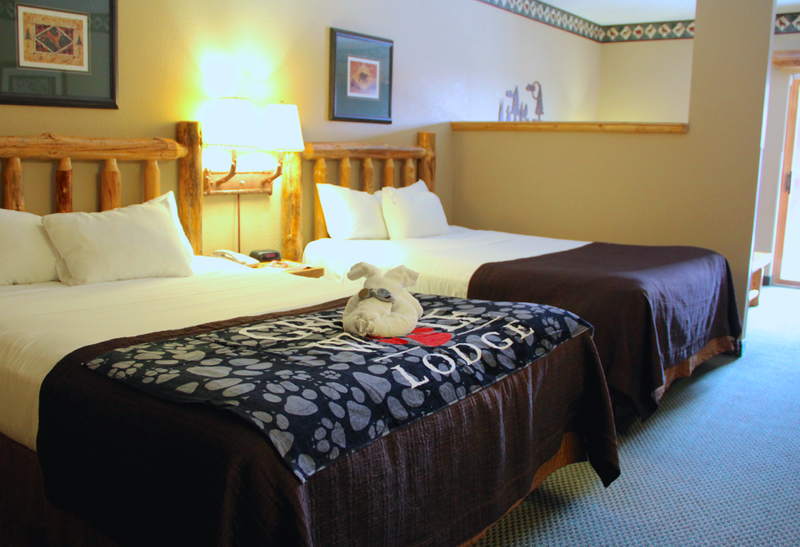 Our family suite, which is considered a standard room with two queen-size beds, was located on the third level in room 3009. It is a long walk down the corridor but hey, I can use all the extra exercise I can get! The beds were very comfortable and we found extra blankets for added warmth. Across from the sleeping area is where you will find a microwave, a coffee maker, a mini fridge and a safe to store any valuables. Also, each room is accessible via your wristbands. Simply place the logo one inch away from the two dots above the door handle to unlock it. These special RFID wristbands combine room key, waterpark admission and charging abilities all in one. Ours were gold in colour since our family has been at the resort more than once. On the other side of the partition is a semi-private living area which includes a full-size sofa-sleeper, coffee table and a 37" flat screen TV. With the sofa-sleeper, you could fit six guests in this room. Or you could use it to banish your snoring partner from the sleep area. Whatever works. The bath is quite small but functional and clean. The shower includes a multi-use soap dispenser so you don't have to fiddle with separate bottles of shampoo, conditioner and body wash. Not that I can read those little labels without my glasses anyhow. This mom is grateful for one-soap-does-it-all dispensers. 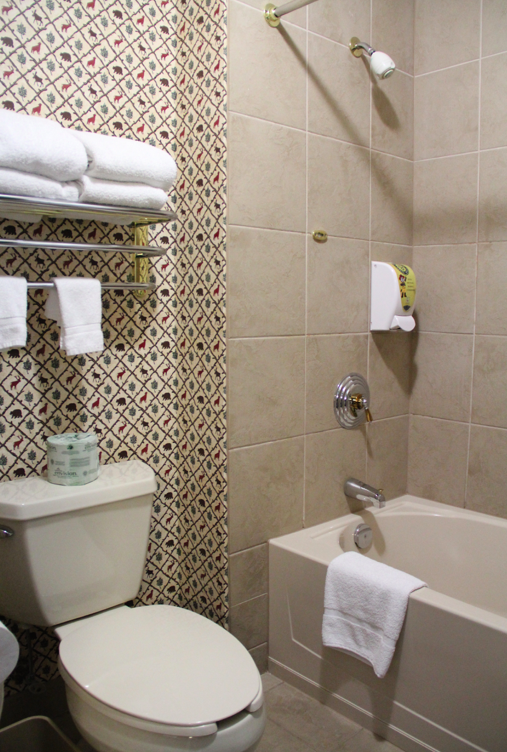 Across from the bath, you will find the sink and blow dryer. Personally, I prefer to have the sink in the bath room. Oh, and in case you've ever wondered what those two round things on the shower walls were... it is a retractable clothesline where you can hang dry your swimsuits and trunks after rinsing so they'll be ready to go in the morning. Since our room is located on an upper level, we had a balcony that overlooked the outdoor pool, currently covered in snow, of course. In the past, we had a room on the lower level which was great because we didn't have to take an elevator or use the stairs to access the waterpark. Plus, we had a walk-out patio that lead to the parking lot at the back so we had easy access to our car. 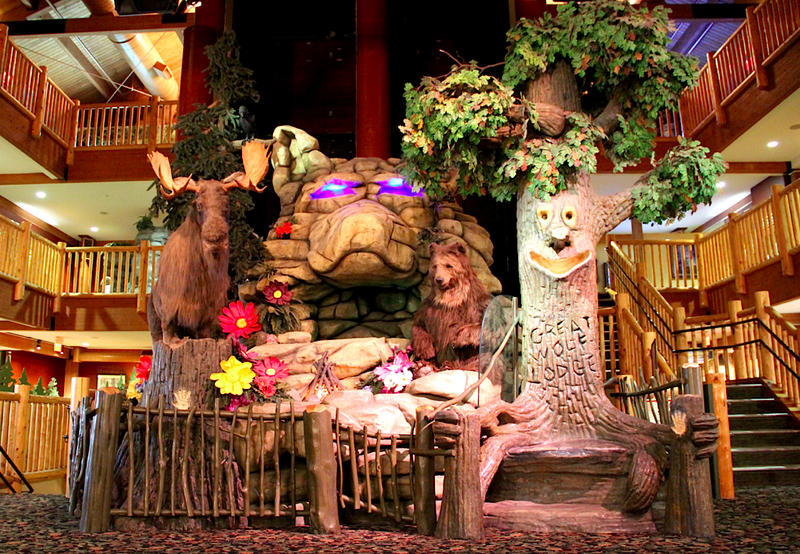 If you've never been to Great Wolf Lodge before, be prepared to be awed by their magnificent grand lobby. Here you will find the Welcome Desk where you can check in as early as 1 p.m. The lobby is also where you can lounge by the fire, as well as view and order photos taken on some of the water rides. If you are a returning guest, there is a separate lineup closer to the main entrance, which is usually a lot shorter. Don't forget to ask for your Family of the Day ballot. You will need it to enter the drawing the following morning before the waterpark opens. If your ticket is drawn, your family will enjoy a private cabana in the waterpark that houses a patio table, a lounge chair and a bar fridge filled with bottled water and snacks. 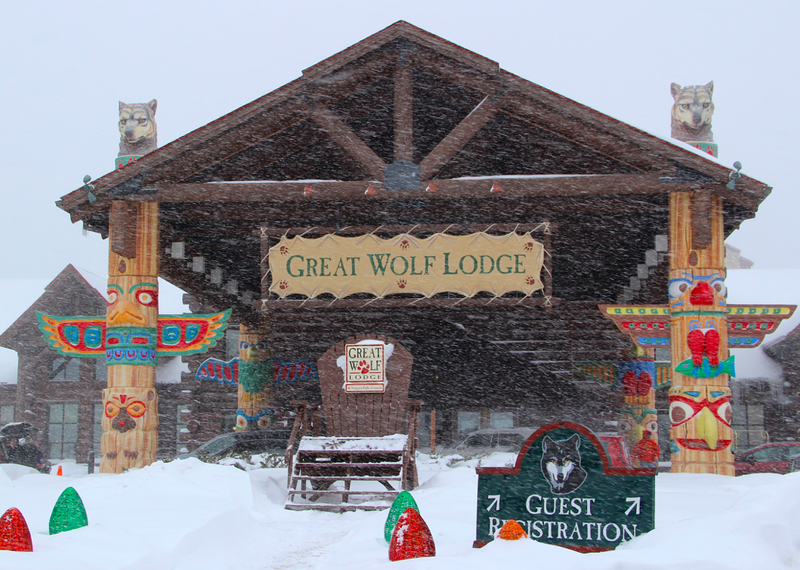 The winning family will also enjoy other perks such as tokens to the Northern Lights Arcade, Great Wolf Lodge paraphernalia or vouchers for a free craft, for example. 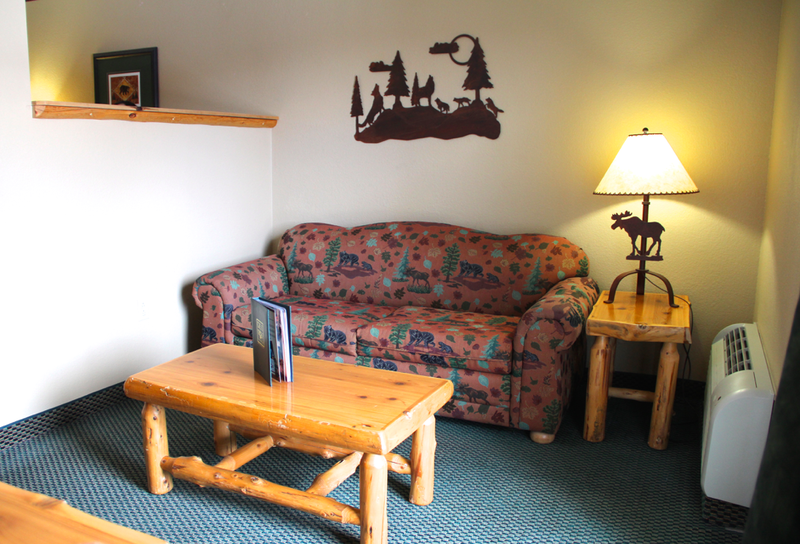 At the end of the lobby, you will spot the lovable group of Family Forest Friends. They come to life at the push of a button and if you stop by at 10 a.m., you can hear Mo the Moose, Mother Bear with her cubs Ivy and Rusty, and all the animals sing about life in the forest. This is also where they host their nightly Story Time sessions. We enjoyed a well-animated reading of Robert Munsch's Mortimer while we were there and the place was packed! Following the story, they turned on some music for a little dance party. In pyjamas! 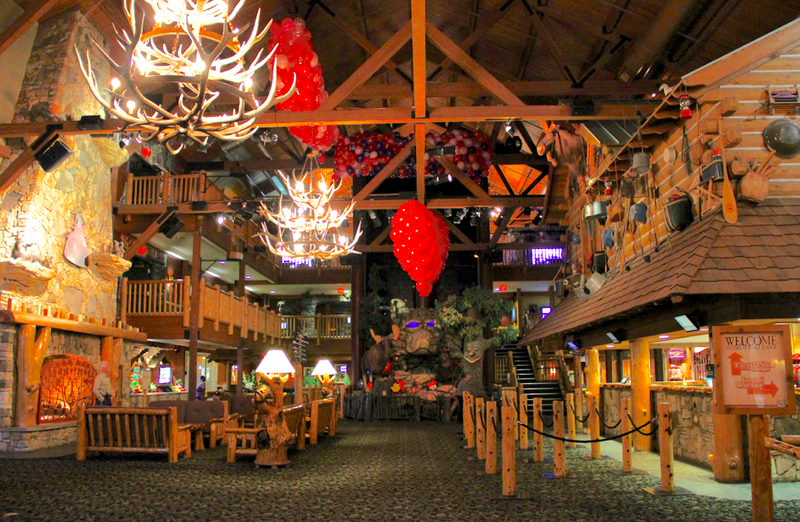 To the left, you will find the two main dining areas: Antler Shanty and Camp Critter Bar & Grille. To the right, you will find the Trading Post Gift Shop and MagiQuest Marketplace as well as the Canoe Coffee shop and public restrooms. Everything else is pretty much located on the lower level including access to the waterpark. Stay tuned as I continue with the next instalment in my Great Wolf Lodge Niagara Falls series which will feature the waterpark and activities the whole family can enjoy. Want to escape the cold weather for some water fun? 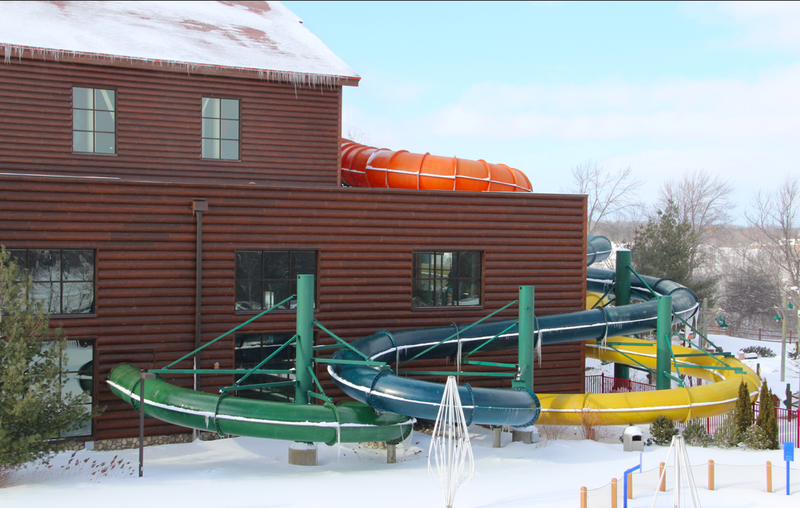 Great Wolf Lodge has set up a special promo code for readers of Toronto Teacher Mom. 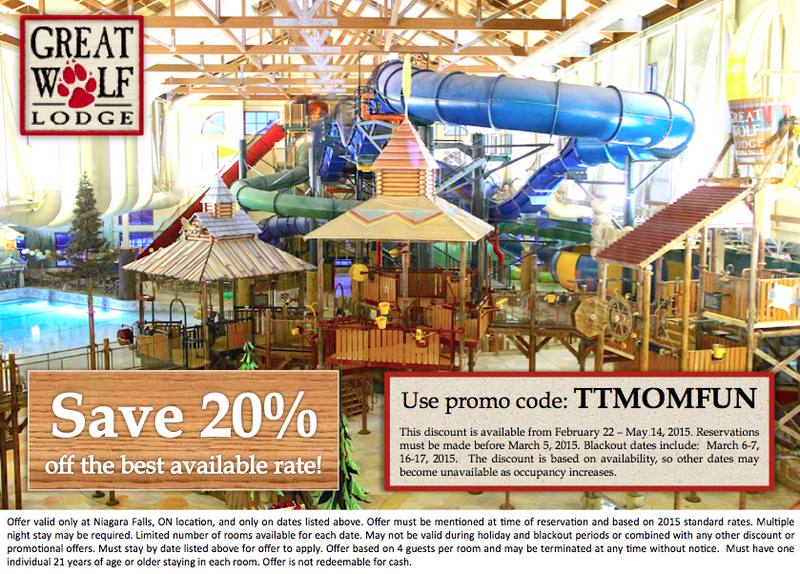 Simply use TTMOMFUN when you book a getaway between February 22 and May 14, 2015 to enjoy 20% off the best available rate. Please note that reservations must be made before March 5, 2015 and that there are the following blackout dates: March 6-7, 16-17, 2015. The discount is based on availability, so other dates may become unavailable as occupancy increases. Offer valid only at Niagara Falls, ON location, and only on dates listed above. Offer must be mentioned at time of reservation and based on 2015 standard rates. Multiple night stay may be required. Limited number of rooms available for each date. May not be valid during holiday and blackout periods or combined with any other discount or promotional offers. Must stay by date listed above for offer to apply. Offer based on 4 guests per room and may be terminated at any time without notice. Must have one individual 21 years of age or older staying in each room. Offer is not redeemable for cash. What a gorgeous fun place! My husband and I were talking about Great Wolf Lodge a few nights ago, we're thinking we might want to get away with the girls there this summer! Thank you for a great post. Oh, I hope you get to go. It's so much fun! I like going in the summer because you can use the outdoor pool and play mini golf. Wow this place looks gorgeous. I love how it is so kid-friendly and how it is so homey and nice at the same time. And thanks for the promo code - what a great deal! They've really outdone themselves with this themed resort. And definitely a place the whole family can enjoy! That looks like an awesome place to vacation with the family! You know, we can't always get away to someplace warm in the winter so this is the perfect alternative. It is. Our family has been five times now! What a great looking lodge! I wish I had something like that close to home for myself - it would be great to have a little get away in the winter to a place with so much to do... Side note: I love the soap/shampoo dispenser being all in one in the bathroom too.. That completely sold me hah! LOL Right? No more fidgeting with tiny travel size bottles that never seem to have enough for one family. It's great that it's so close to the Falls. We always stop by there on the way home but this particular weekend there was a storm blowing in. Thanks for the promo code Diana. 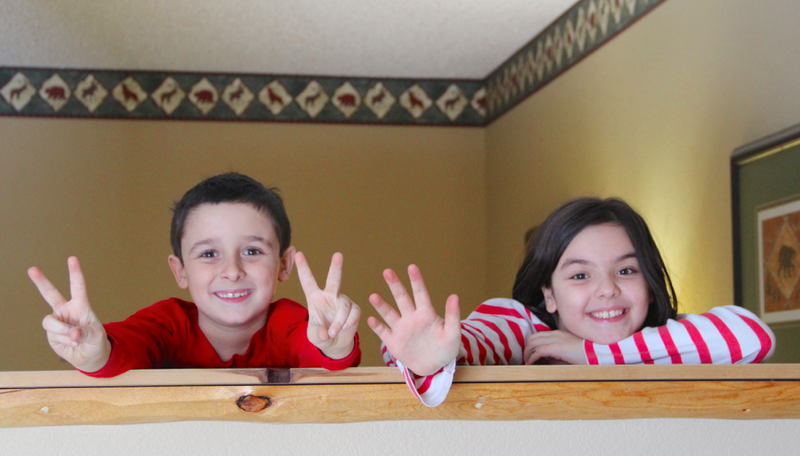 Great Wolf Lodge is such fun for kids - I hope to get back there again. No problem! Hope you get a chance to visit soon! Looks like a great play to stay when visiting Niagara Falls. I have visit there many years ago with my children were young. I think it is time to go back for a visit. This was our fifth time. Can you tell we're big GWL fans? Would love to go here one day! It's one of those places you have to visit at least once. Hopefully you will all get to go soon! I wasn't a fan either. Until I tried MagiQuest for myself. Now I love it. my family loves great wolf lodge ..it is so much fun ..lots to do and see ..
We are hoping to visit this resort this summer! It looks like so much fun! This is such a great place to go, they have so much going on. Everything just looks so fun! Love that waterslide that extends out of the building! Gosh, this place looks amazing! One day I hope to get there with my grandkids! What a cozy little getaway for the family! Even I want to hit those waterslides, they look awesome! I think Great Wolf Lodge is one of the best resorts for kids and adults can have fun to.